White circle meditation is a variation of White Light meditation involving more than one participant, to send Reiki to almost anything we can think of. It is an intense meditation wherein a spiritual downpour of energy flows through every chakra, nadi of our energy body. It is very effective to cleanse our aura, chakra, nadis via this method. Since the circle involves more than one participant, the otherwise powerful white light meditation intensifies and healing is comparatively rapid, effective and amusing. 1. Preparation. Two or more Reiki channels can sit to form a circle. Decide as to what they wish to send healing to (be specific and make sure the healing is for the Highest good), then they can close their eyes and begin. 2. Invocation. Prayer and/or invocation of Divine blessing. Even the attitude of gratitude works. We can even recite Gayatri mantra, chant Om Namah Shivaya, or simply chanting Om works well to shift our mindset to a peaceful and aware state. The prayer of Saint Francis of Assisi can also be recited. 3. Breathing. Deep breathing as per the count 6-3-6-3 for 2-5 minutes works very well. This method involves breathing in at a count of 6, holding the breath for a count of 3, exhaling slowly and steadily for a count of 6 and completing the cycle by holding your breath for a count of 3. Breathing allows more oxygen to reach our system and is also a means to receive guidance and message from higher dimension. 4. Forming the circle. The key to white circle knowing that we receive from the left and give from the right. The participants are seated in a manner that is neither too close nor too far, can now hold hands. Place your left hand facing upwards and your right hand facing downwards. The person sitting next to you should place his/her downward-facing right hand on your upward-facing left hand and vice versa. The link is thus created. In an otherwise active group, energy starts flowing even without the next step. 5. Shielding. Usually, the Light or energy flow in this method is strong enough for any possible unwanted attack but it is wise to shield yourself by any method you normally follow. 6. Reiki symbols. Draw the Reiki symbols to connect to the Source and invoke the corresponding symbol names three times. Let the energy which is Divine white light flow, feel it move from your crown down to the heart chakra and through your arms and hands flowing through every participant forming a circle, a connection. This is called the White Circle. 7. Create a focal point. From your heart chakra allow the Reiki energy to flow to a point at the centre of the circle. This is the point where the Reiki energy from each and every participant meets. The energy created within the circle is very intense and pure. 8. Channel Reiki to the subject. Now suppose you are sending Reiki to Mother Earth or a client or a city or cricket match or even a political issue Reiki will flow manifold. Intensified energy reaches out to the subject and clears all blocks, unwanted energy patterns. 9. Close and disconnect. Once the energy flow has stopped or any of the participants feel it is done. Simply visualize the subject to be protected in a bubble of white light, healed, healthy, cheerful. Disconnect the circle and ground yourself again by any of the method you follow. Release all excess energy by transferring it to Mother Earth. Thank the source, Archangels, angels anyone who might have visited or you invited before the session. Rub your palms together and place it on your eyes and slowly open your eyes gaining composure. Usually during such an intense practice, the energy of our entire residence and that of your locality improves and purifies. The hands-on session enables us to develop our intuitive capabilities, collectively or individually every participant may receive messages or guidance regarding the issue being healed or sometimes even for ourselves, and it also purifies or heals our chakras and nadi system due to the spiritual downpour. During the meditation, we can even use Reiki symbols to whatever we are attuned to be it Karuna Reiki, Karmic Reiki, or even Usui Reiki 3A and B symbols like Dumo or Tibetan Fire Serpent if we come across reluctant or obstructive blocks in the energy flow. Nazima Begum says – We have been practicing the white circle meditation for years. 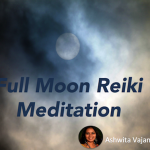 Every issue that comes up in our Reiki community we address that during our monthly Reiki meet via the White Circle meditation. Some difficult issues take time but we all have received guidance and support from the higher dimensions. While comparatively less difficult issues tend to resolve in a few days time. Besides, during meditation the energy levels raise high enough to bring an ecstatic feeling. We also include non-Reiki channels in the circle whoever wishes to join in and receive Divine blessings. My own experience with this meditation is intense, perhaps I never realized ‘energy flow’ until I tried the White circle meditation. Yes, channelling Reiki did make my hands warm more often than not, but during this process I felt Reiki flow through my entire being. I could actually feel every chakra buzz with Reiki. Do practice and keep your intent clear and precise. Lots of power to you all.